Peter Lowenstein captured thin curtains of golden virga on one of the first sunsets of rainy season in Mutare, Zimbabwe. The first rains of the rainy season have fallen in Mutare over the past three days and humidity has been high. This afternoon cloud started to clear allowing the setting sun to emerge and shine brightly from a gap beneath it. Then something strange happened. 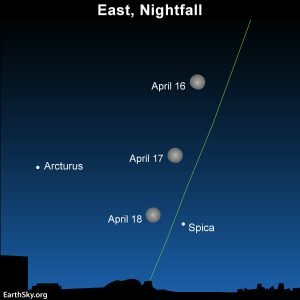 At 10 minutes to 6:00, a patch of mist produced by condensation from moist cooling air began to reflect the setting sunlight to produce a bright spherical and then oblong apparition which floated for a minute or two directly above Hospital Hill. A short time later more widespread sunlit veils of condensation started to form and then developed into beautiful thin curtains of golden virga which for a few minutes shone brightly and remained suspended in the air. Camera: Panasonic Lumix DMC TZ60 in sunset scene mode. We’ve all seen virga, but maybe not known what it’s called. Virga is rain that evaporates before it hits the ground. 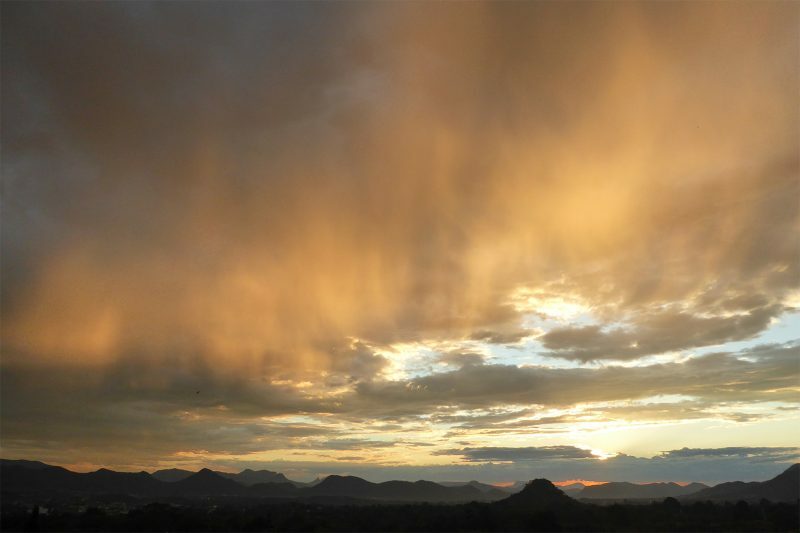 Bottom line: Photo of virga in Mutare, Zimbabwe. Dr. Peter Lowenstein has contributed many beautiful and fascinating images and stories to EarthSky. Trained as a geochemist, he spent his early years with the Geological Survey of Papua New Guinea, specializing in metals and volcanoes. In 1989, he moved to the Zimbabwe Geological Survey as Chief Economic Geologist and has lived and worked in Zimbabwe ever since. Peter is now retired to Zimbabwe, in a house with a beautiful view in Murambi East, Mutare, where he pursues favorite hobbies including construction of electronic gadgets, listening to music, gardening, surfing the Internet ... and photography.